If you use Google Calendar's quick add feature, you know it is way better than using the form to add events/appointments. Unfortunately, those who have multiple calendars cannot avoid using the form for entering appointments. Quick add currently adds events only to the default calendar. To add an event to any other calendar you have to go to the form to choose that specific calendar. This more or less defeats the purpose of having quick add. It would be nice to be able to use quick add to add events to a specific calendar. 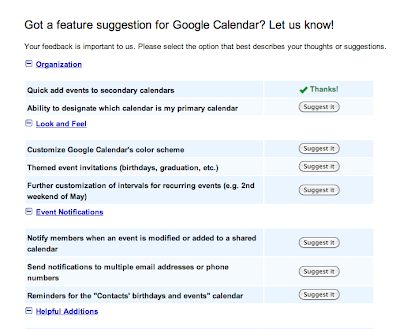 Numerous users of google calendar have requested this feature in forums, at least since 2009. It is not clear to me why Google refuses to add, what appears to be a simple feature, despite so many requests. Is it not possible for them to do it? If so, they should let us know on one of these forums, or on the page where they explain the quick add feature. 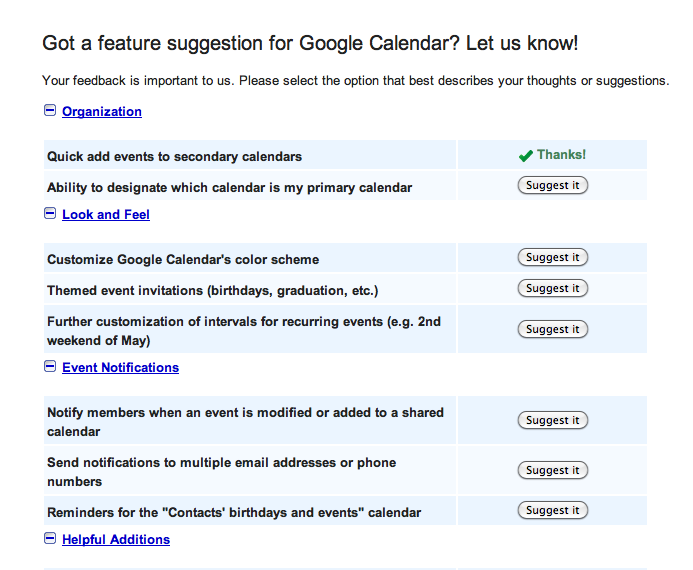 Anyhow, they have made it possible for us to let them know that we want the feature by listing this feature on their Google Calendar feature suggestions page. If you care about this feature, please go to the link and vote for it. In the Organization menu, press the suggest it button next to Quick add events to secondary calendars. The screenshot below shows what you see once you have made the suggestion. I have not recently checked whether Google calendar has yet added this feature. But if they have not, and you use Mac, and you are tired of waiting around for Google to add this feature, I would strongly recommend using an awesome app called Quickcal to do this. At the time I am writing this, it costs $2.99 and it is certainly worth that amount. It works both with your iCal and with your Google Calendar. I have been using it for many months now and it works great. Thanks for your note! I too want this feature.